Located in rural West Texas, Odessa College is a Hispanic-serving institution in communities with historically low college attendance, many first-generation college students, and significant socioeconomic disadvantage. The College’s faculty and staff have gone to great lengths to identify and address common problems their students face, with an array of inventive student success initiatives. Faculty teams have led course redesign initiatives to transition high-enrollment courses to open educational resources (OER). These projects have improved affordability and access to learning content, and they have given Odessa College faculty greater control over how to shape the learning experience to fit their students’ needs. In addition to faculty-led OER course redesign projects, Odessa College has implemented other inventive student success initiatives, such as eight week terms, FAFSA workshops, Success Coaches, a Drop Rate Improvement Program to increase students’ connection to their courses, and first-class free for all students. 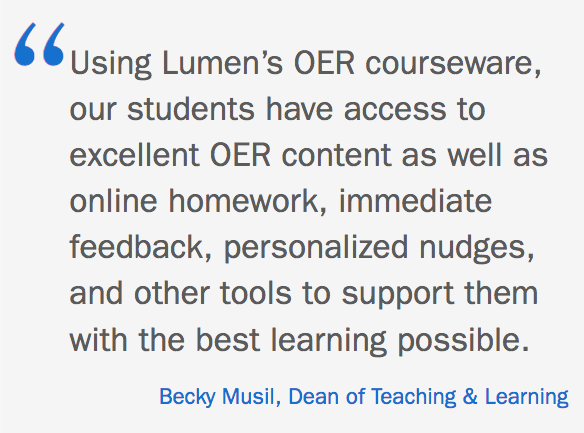 Lumen Learning provides affordable course materials designed using open educational resources (OER), with a catalog focusing on high-enrollment general education courses. Our goal is to provide OER that are better for learning and simple for faculty members to adopt. Discover OER course materials that are a great fit for you and your students: visit our public catalog or download our course list.